1. Put the ricotta in a sieve and leave to drain over the sink for about 5 minutes. Meanwhile, lightly grease and line the base of a 23cm springform cake tin. For the base, put the brown sugar, biscuits and ground ginger in a large mixing bowl, season with salt and pour over the melted butter. Mix well, then press the mixture into the base of the tin with your fingers. Compress further by rolling with the side of a small glass. Put in the freezer for 15 minutes to set while you prepare the rest of the cheesecake. 2. Soak the gelatine leaves in cold water for 10 minutes. Put the lime zest and juice in a heatproof bowl with the caster sugar and set over a pan of barely simmering water (making sure the base of the bowl doesn’t touch the water). Squeeze the excess water from the gelatine leaves, then whisk into the warm lime juice mixture until dissolved. Take the bowl off the heat and whisk in the soft cheese and drained ricotta. Spoon over the cooled biscuit base, smooth the top with a spatula and chill for at least 4 hours, preferably overnight, until the cake tin feels cold. 3. Put the gooseberries in a pan with the caster sugar and elderflower cordial. Gently heat over a low heat, then simmer for 4-6 minutes, stirring gently until softened and just burst. Add the lime zest and juice; set aside to cool completely. 4. 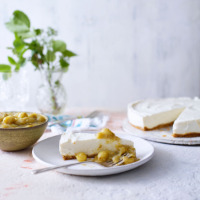 Carefully remove the cheesecake from the tin and serve sliced with the gooseberries spooned over.